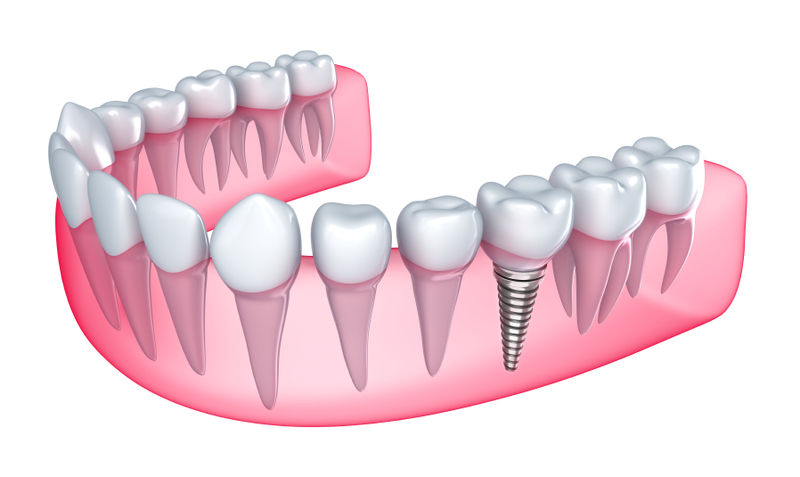 A dental implant is a solution to missing or damaged teeth. While dentures and bridges work as well, the benefit of dental implants are the permanence of them. Dental implants are surgically implanted in place of the original root of your tooth, making them look and function like a normal tooth. Because dental implants function like a normal tooth, there is no need to worry about the slipping caused by dentures or the damage that bridges can cause to surrounding teeth. Dental implants remain in your mouth and you can eat, talk, and smile normally with them. Dental implants are typically made of titanium, which is a biocompatible metal- meaning that it is not harmful to the living tissue in your mouth- that can be easily integrated into your mouth. This titanium post is then surgically implanted in place of your root. A replacement tooth, or a dental crown, is then created from a mold that your dentist takes from your teeth, and is placed over the implant to create the look of your natural tooth. After the dental implant is surgically inserted it typically takes about 12-24 weeks for the implant to heal, in which time the titanium post is fusing with the bone in your mouth and creating a permanent seal to your implant. This is a big benefit of a dental implant, unlike dentures or bridges which only rest on the surface of your mouth, dental implants become a part of your mouth. With proper care and hygiene, a dental implant can last a lifetime and not need replacing in 5-10 years as other tooth replacement solutions do. Dental implants are not typically covered by insurance, so it is important to talk to your insurance provider before making a decision. However, along with the previous stated benefit of not needing to replace a dental implant, you are also not able to get a cavity in a dental implant. So, dental implants can turn out to be a very cost-effective solution for tooth replacement. Schedule an appointment with us here at the Arizona Periodontal Group to see if dental implants are right for you. We are one of the best options for dental implants in the Phoenix area, and we would love to help you!